Avery and I are having some fun in San Antonio this week. It's nice to get out of Laredo for a bit. Last night we went over to my Aunt Connie and Uncle Tommy's house. 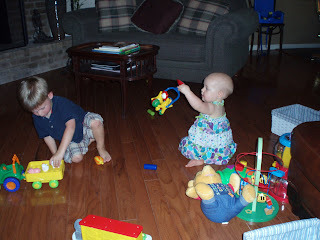 Avery was able to have some play time with my cousin Stephanie's son, Preston. Preston was very sweet and gentle with Avery. He seems to really like babies. Once it cooled off a bit, we splashed around in the pool a little. 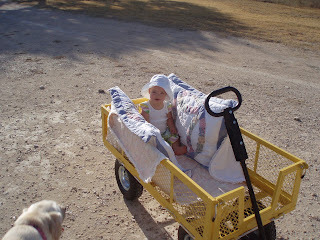 When Omie and Opa decide to buy a wagon for the ranch, they buy a WAGON. This is like the John Deer of wagons. Avery seems to love the bumpy ride. We have an update from this post. 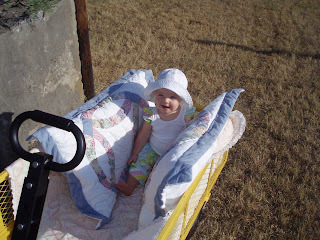 Once again, after xrays and consultations with specialists, Avery has been declared 100% healthy. Praise the Lord for chubby little baby legs. Let's hope this is the last round of pointless xrays for our little one for quite a while. Thank you for your prayers.